General dentistry is a non-specialised area of dentistry the general dentist will be qualified to perform a wide range of dental treatments, but he or she may not be qualified to undertake specialised dental work. Specialised fields of dentistry that require further training can include prosthodontics, orthodontics and dental surgery. A general dentist will be the first point of call in the maintenance, general health, preventative and restorative treatments for your teeth and gums. Many people have a lifelong relationship with the same dentist that may start in childhood, and the dentist will soon become known as the family dentist. For other people who may be new to an area the best way to find a dentist is through referrals from other people and word of mouth. It is becoming increasingly difficult to register with an NHS dentist due to dental staff shortages and waiting lists to register are long. Emergencies can always be seen at dental hospitals and details of many NHS and private dentists can be found in your local telephone book. The range of treatments that a general dentist will perform is wide ranging, but unlike a specialist dentist a general dentist can decide which services he or she will offer. 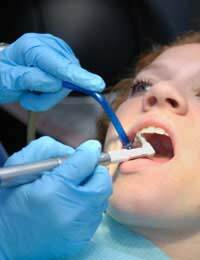 If the dentist is unable to perform a treatment that you require he will usually be able to refer you to a specialist. Treatments included in the general dentistry field will include simple, six monthly check-ups, fillings and root canal work. The dentist will also be able to diagnose and treat oral infections such as gum disease, and may if necessary perform tooth extractions. The dentist may also have undertaken specialist training that will allow him to perform more complex operations such as bridgework and in some cases, dental implants. In recent years cosmetic dental treatments have become a large part of the dental workload. People are spending more time and money on their teeth than every before. A set of straight, white teeth is seen as a sign of good health and also adds to person’s overall appearance. Many people are ashamed of their teeth and will hide their smile; this can be blow to an individual’s confidence and can have a detrimental effect on their overall lifestyle.General dentistry encompasses many forms of cosmetic treatments and can include teeth whitening and straightening, dental veneers, and white fillings to replace old, metal fillings. Cosmetic treatments will usually have to be paid for by the individual having the treatment, but the overall benefit to appearance will usually be worth the extra money. Six monthly check-ups by your dentist are vital in maintaining healthy teeth and gums. Many dentists will agree that prevention is their main goal. The six monthly check-up is important in order to detect any early signs of gum and periodontal disease. You might think that your teeth and gums are in a good condition, but dentists are trained to spot the signs of gum disease before you will be aware of it. Gum disease and decay are big factors in tooth loss, so it is in your best interest to maintain the bi-annual check-ups. Many people have a fear of visiting the dentist, even if it is just for a check-up. Dentists are well aware of this problem, and are used to dealing with nervous or anxious patients. They also used to dealing with nervous children and their parents. Dentists are trained in offering support to anxious patients and are more than happy to answers any questions you may have over treatments and procedures. For patients who are extremely nervous during treatments, sedation dentistry may be advisable in order to calm them down during any dental work. Ask your dentist if he or she offers sedation dentistry, it is a popular option that is offered by a large number of dentists. Maintaining a good daily dental regime and regular visits to the dentist is vital for healthy teeth and gums. Think of your general dentist as the person who will make sure that you keep your teeth in top condition for the whole of your life. The general dentist can help get the most from your teeth, and all it may take is two regular visits per year.